In our desire for a union of all the five Somali inhabited territories of the Horn in 1960, we, in Somaliland, gave up our own independence and our own first (1960) constitution and accepted, without any previous involvement whatsoever, a constitution drafted, in Mogadishu (Xamar) by Somalians. By the time, the vast majority of Somalilanders voted overwhelming against that constitution in the referendum held on 20 June 1961, our regrets over our precipitate union with Somalia were already abundantly clear. That first constitution was abrogated by the military regime in 1969 and its place was taken by another one drawn up in Mogadishu in 1979 by the Siyad Barre Dictatorship, which was endorsed at another national referendum held on 25 August 1979. Long before the military dictatorship ended in 1991, the dream of a union of all the five Somali inhabited territories turned into a delusion. After the brutal and costly war of the 1980s waged by the Military dictatorship against the Somaliland people and the collapse of the state in 1991, the Somaliland communities met at a Grand Conference in May 1991 and decided to re-gain their sovereignty, as an independent nation. The Somaliland people and their traditional leaders then embarked on a long process of re-building the peace between its communities and on establishing the necessary institutions of governance. Drafting a constitution came after those initial peace-making processes were laboriously undertaken. This involved three incremental stages: the adoption, through constituent assemblies, of a National Charter in 1993, followed by an Interim Constitution in 1997, and then finally the adoption of a Constitution in 2000 which was endorsed at a national referendum held on 31 May 2001. Somaliland also set up democratic institutions and held successfully since 2002 two national presidential elections and parliamentary and local elections, which were all adjudged fair and free by international obersvors. Nine political parties/associations are now busy getting ready for the nation-wide local elections to be held in November 2012. In the last 20 years, numerous peace-making and government building conferences (and initiatives) had been held for Somalia. Somaliland has never attended any of them. And yet, old habits die hard and in two of the peace conferences held for Somalia abroad (in Djibouti in 2000 and in Kenya in 2004) where Transitional Charters for “Somalia” were adopted, the wishes of the painstakingly crafted Somaliland democratic national institutions (which included political parties, elected president and parliament) were deliberately disregarded. The Somalian organisers of the conferences and their international sponsors decided that the Somaliland territory was henceforth inhabited by a newly invented clan called the “DIR North” which covered the majority of the Somaliland people and that the rest of the population shall be counted as part of the “DAROD” Greater Somalia Clan. So with this fictitious identity, individuals (mainly from abroad or from Somaliland) were enticed to participate in the conferences in order to maintain the charade of Somaliland’s involvement in these processes. These individuals represented no one but themselves and are and have been considered criminals under Somaliland law. After two decades, and with Somaliland having held another peaceful presidential election and a smooth transfer of power from a defeated sitting president to a new one in 2010, who is ruling with an elected House of Representatives, one would have expected that the international community would no longer remain blind to the presence of a genuine democratic representation in Somaliland that can speak authoritatively for the Somaliland people. The international community was aware of and accepted Somaliland’s non-involvement in the “Roadmap” to end the “transition in Somalia” and so the Roadmap process including the adoption of the Constitution was driven by a group of signatories consisting of the Transitional Government (TFG), UN Representative, and Puntland, Galmudug and the ASWJ representing the Northern and Central regions of Somalia. At the London Conference in February 2012, the international community also agreed “to support any dialogue that Somaliland and the TFG or its replacement may agree to establish in order to clarify their future relations” and a couple of preliminary meetings between Somaliland and the Somalian TFG have already taken place. But, yet again, the whole new process of the adoption of the a new Somalian constitution and the selection (not election, as originally envisaged) of the new Somalia Assembly members was based on the same formula of denying the existence of Somaliland’s elected representatives and seeking to attract the participation of individuals from the same fictitious clan. Worse still, the emphasis on clan representation has already led to numerous Diaspora based individuals declaring “virtual clan states” even in the territories of Somaliland and neighbouring Puntland region of Somalia. Attempting to break up Somaliland into various clan areas will neither bring back a new united “Somali Republic”, nor will it leave unaffected the patchwork of clan based disparate regions in Somalia as can already be seen in the numerous declarations of “virtual mini-states”. Somaliland was never involved in the making of Somalia’s new constitution, or in the selection of its new Assembly or government in Mogadishu. The vast majority of the real traditional leaders of Somaliland remained in Somaliland and met in Hargeisa and Erigavo a few weeks ago when they denounced the invitations extended to them. Attracting, therefore, a few mainly self-appointed elders from Somaliland who, in turn, picked “hasbeens” and “wannabes” from abroad neither co-opts Somaliland into this process, nor does it give the process any legitimacy in Somaliland. 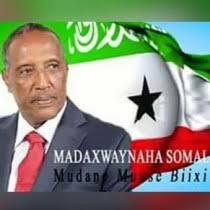 It simply reinforces the Somaliland people’s belief that the prevailing attitude in Somalia is still the desire to run Somaliland from Mogadishu (Xamar). This casts serious doubts on the future of the planned talks between Somaliland and the Somalia government agreed at the London Conference only six months ago and will pose a new threat to the fragile peace and stability in the Horn of Africa if the new Somalia government starts interfering in Somaliland’s affairs. As the Somali sayings go, only a blind person can fall into the same hole more than once, and that losing your way on a road makes you learn it well. We lost our way once in 1960 when we gave up our sovereignty and have since counted the cost of that mistake in loss of liberty, limb and life, specially throughout the 1980s. We shall never do that again and will guard and defend our precious sovereignty. 1. To the people of Somalia: We have our country, our people, our constitution and our state (Dalkayaga, Dadkayaga, Distoorkayaga iyo Dawladayadda), so please sort out yours. We can live in peace and prosperity as two neighbouring Somali states in the same way that we do with our Somali neighbours in Djibouti and in the Ethiopian Somali region. 2. To the incoming Government of Somalia: You have no authority or legitimacy to interfere in Somaliland’s affairs. We hope that your priority will be making peace and re-building your country. Whether or not the planned talks with Somaliland bring about a lasting benefit for both countries or end before they even start will depend very much on your attitude towards Somaliland’s independent status. 3. To the International Community: The Somaliland people have exercised their right to self-determination and withdrew out of a union with Somalia 21 years ago. It is time that you respect our wishes and those of our democratically elected representatives. 4. To the Somaliland Government: We expect that the appropriate law enforcement agencies will prosecute to the fullest extent of the law any Somaliland citizens who, acted in contravention of the Somaliland Constitution and the 2003 Law forbidding participation in Somalian conferences and making it an offence for anyone to usurp the roles of Somaliland’s constitutional bodies. 5. To the Somaliland People: Unity is strength. Let us all promote our Somaliland Constitution and strengthen our democratic institutions. 6. To the Somaliland Civil Society Groups: Be mindful of our own Somaliland national identity and laws when considering the attendance of meetings/seminars abroad. 1. The blatant ballot stuffing at that 1961 referendum was evident from the reported yes votes of 1.79 million (90.1%) – a figure which was nearly twice the total number of people who voted in the following 1964 national (assembly) elections. Although many of the districts in Somalia returned grossly inflated yes vote, the district of “Wala Weyn” returned a 100% yes vote of 69,000. Somalilanders, from then onwards, referred to Somalians as as “Wala Weyn”! 2. Although unrecognised by the international community, Somaliland’s May 1991 act of dissolving the union with Somalia, after a long war waged by the then government against the majority of the Somaliland people followed by collapse of the state, was not (as confirmed by confirmed by the International Court of Justice in the Kosovo case) contrary to international law. • “SOMALI” – refers to the ethnicity shared by all the people of Somali ethnic origin who inhabit the five Horn countries of Djibouti, Ethiopia, Somaliland, Somalia and Kenya. • “SOMALIA” – refers to the former Italian Trusteeship territory of Somalia and, in this Statement, also to the same territory since 1991 to distinguish it from Somaliland. • “SOMALIAN” – refers to someone who comes from Somalia (in contrast to Somalilander). • “THE SOMALI (Democratic) REPUBLIC” – refers to the state formed by the union of Somaliland and Somalia which lasted from 1960 to 1991. The “democratic” middle adjective was added after the Military coup which toppled the then truly democratic government and proceeded to establish a dictatorship originally modelled after the “democratic” countries of the East Germany, North Korea, North Vietnam etc.